I am currently sitting in a giant yellow gauze gown next to the window of a 7th floor hospital room. Outside it’s a balmy 75 degrees with clear, sunny skies. Inside it’s the view of my teeny-tiny almost 3 month old attached to an IV, sleeping in a little bassinet made of rolled up towels. I may actually take the idea home with me. It’s working well here. She’s slept most of the afternoon- which is nice, because she didn’t sleep last night. Ive taken the opportunity to have breakfast, brush my teeth, make my “bed”, have a quiet time, answer emails and mindlessly browse Facebook and play games on my phone for a while. I should try to nap but I’m a little listless right now. What’s wrong with the baby? Well… good question. Adenovirus, for one. Vicious mouth sores for another. Still not sure of the source. Lack of appetite. Diarrhea on the mend, we hope. And vomiting coming to an end, if only because she’s not eating that much today. Every day is a new plan around here. That’s fine- I get it. It’s been that way for the better part of the last 3 months as we tried every solution under the sun for colic and general crankiness. It was almost grasping at straws for a while. Of course, I’d like to move on to a plan that works. -my wee little one being sick and in pain has allowed her to let me comfort her in a way that couldn’t be done during the intense colic stage. This is a giant balm to my soul that I can’t even express, to finally have the right touches and timing to help her. Being able to do that gives me a big peace. -my other bundle of joy is able to run around, be loud and obnoxious and enjoy evenings with all the lights on in the house. Even from far away, that gives me joy as our evenings over the last couple of months have been spent in minimal lighting and silence and frayed nerves. That’s hard on a 3 year old. -We comfort those with the comfort we’ve received– it’s a new understanding of what parents with little ones in the hospitals go through. I don’t honestly feel our situation is dire, though it’s not good and there are a lot of unknowns, but I have a new understanding of the emotions that you feel when you go back through “the doors”, back into the halls where your little one lies in pain and not knowing what will await you. When you leave for breakfast when everyone else is bringing in their lunches and you’re bone tired and don’t feel like thinking. The quietness of a hospital room when your little one is finally resting and nurses and all the rest of the world is about their business. The anxious waiting for the visit of the doctor to hopefully find out more or discuss the next plan. I had compassion when I was single. I had a more tender heart when I became a mother. Now I have experience– or at least a little of it. More than I want. But my heart has new compassion and yearning (??) for friends who recently or are currently going through rough rough situations. Well. I’m tired of vomit and diarrhea and mystery sores. On to some amusing anecdotes. -the doctors and nurses are in wonder at the white and pink noise tracks I use almost around the clock to calm baby. “What is that?! !” They ask. I think they think I’m weird. -I didn’t have my name stamp (you use that here in Japan for official documents) when I had to fill out hospital admission paperwork. So, instead they had me use the red stamp ink on my forefinger and sign with my finger print. Isn’t that interesting?? -in general, most Japanese are entranced by the Boba baby wrap carrier that I use with our little one. It’s the only way I’ve survived the last couple of months. But no one I’ve met has seen it before and I always get a crowd when putting it on and tucking her in. The Ergo baby carrier is most popular here but I’m waiting for Eliana’s neck to be more stable before I switch to mainly using that. -it’s a dollar a day to use the teeny tiny refrigerator in our room. (They use a prepaid card which also works in you want to use the tv). I also cannot eat or drink in the room or use the room’s bathroom here. There are rental beds but they’re out of them right now, so every night I arrange three chairs and sleep across them. It’s surprisingly not too bad! -you also bring your own diapers, wipes, throw away bags for diapers, and towels here. Every diaper is weighed and added up in a room down the hall and then thrown away. I’m not sure, but I think we will have a trash charge on that account. -my husband won a special husband of the year award when he brought me a pillow without me even thinking to ask for one. He also packed a chocolate bar and usually brings me a new goodie. Well. Baby is stirring. Probably time to go. It was nice talking “at” the outside world for a while. Blogging is often a relaxing activity for me. And it’s nice to have a feeling of normalcy when you’re siting in a giant yellow gauze gown. 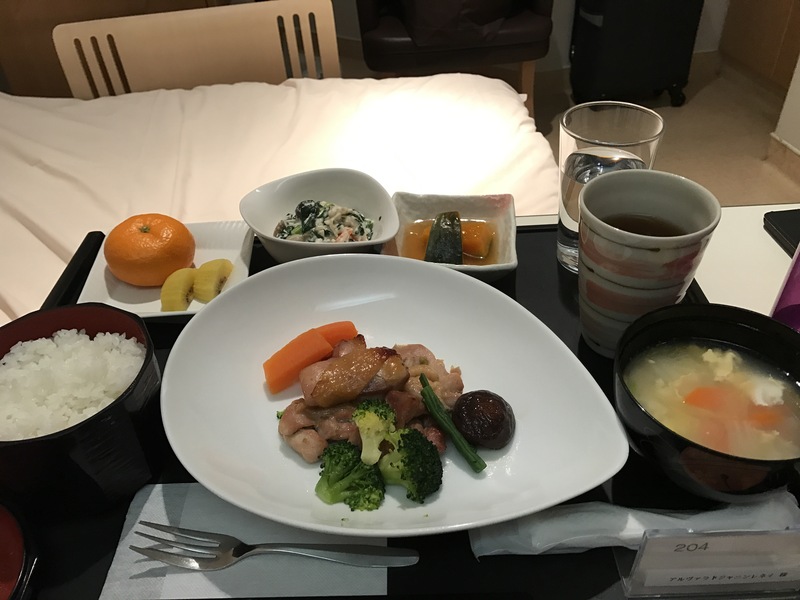 A couple of days after the delivery of your baby, the staff of the hospital or clinic will give you a Birth Report (Shussei Todoke/Shussei Shoumeisho), which will have two sides. One side is filled out by the hospital and the other side is for you to fill out. This will begin the grand process of legalizing your baby… and for us, it created a giant pool of confusion! Within 14 days of the birth of your child, either (or both) you or your spouse will need to make a trip to City Hall to register the baby’s birth and receive the birth certificate. The baby does not need to be present. Present these documents at the desk and eventually, they will give you them back, with a paper attached to the Shussei Shoumeisho showing you have registered the birth. Too bad I’m not Japanese. I’m really glad I wasn’t there for this discussion. It’s not a big deal, though a pain in the tuckus in the long run. What complicated our situation a bit more was that he added the middle name to the last name box, so in effect, it appears that our daughter has two last names. I don’t know what the deal is because no one else I know has had a problem like this. Believe me, I asked around. I think it was just a power kick, or that he ran into some troublesome foreigners earlier in the day. I don’t know. But as the guy at the US embassy told me (though we had some dramatic pauses while they examined our daughter’s two last names…)– you can name your kid whatever you want in America. The NHI counter for health insurance, the child health program (to get the free doctor visits postcard) and the Jidouteatte counter. *Note that you will be issued a temporary health insurance card until the baby’s visa is established. -A copy of your Residence Record (Juminhyou) with your new child’s information on it. Note: Make sure that you get everything listed on the Juminhyou– you will need your residence card number, type and expiration dates printed on there as well. Don’t ask how we know. -The most recent tax payment certificate (Nouzei Shoumeisho/Kazei Shoumeisho). If one parent is a dependent, you will need that record that they were listed as a the taxpaying parent’s dependent. Note that your deadline to complete this is 30 days. One parent (or a guarantor) can do this, and the baby does not need to be present. -Application form for Permission to Acquire Status of Residence- no need for a photo of the baby. Also, the working parent is to be listed as the guarantor/legal representative on the form. Submit all these documents and viola! You will be issued a residence card for your little one. Once this process is complete, your city hall will then mail you a health insurance card for your baby with a longer expiration date and a “my-number card” application, which you will need to fill out (can be done online too) and send in. Note that if you do not complete the above two processes within the allotted time, they very well may try to deport your baby. It happened to a friend of a friend, so if need be, collect all the applications and documents (beside the Juminhyou- you have to wait for that) ahead of time. This one’s a doozy guys! Thankfully, there’s no real deadline for this part (unless you plan to travel soon). We went when the baby was two weeks old because of all the unknowns with the middle name and how that would affect her at immigration (resolution below). Also, both parents will need to be there (or a notarized document stating why it’s not possible) and the baby needs to be present as well. Completed Application for Consular Report of Birth Abroad- Note about the times of physical presence in the US: though the form says you have to be very specific about dates, the rep I talked to and every other person who’s gone through the process says that only major chunks of time outside the US need to be accounted for. Don’t stress over a week here or there for vacations. An English translation of the above document- you can get a template on the embassy’s website; it does not have to be done professionally. Note: The issue date is the date that the document is registered; the title is the title of the document and the name is the name of the person who registered the document (on the attached paper of the Shussei Todoke Shoumeisho). Evidence of Physical Presence- though we were not asked for it. Consider using transcripts, job evaluation records, tax records, medical receipts or prior passports, etc. Note that only one parent needs to present this info. Both Parents IDs (plus a copy)- your drivers license or Japanese Residence card will work. This is also something we weren’t asked for. A self-addressed Letter Pack Envelope (you can purchase at a the Post Office or the Family Mart nearest the Tokyo Embassy. You will need to schedule an appointment at the embassy (arrive early to go through security– note that if there’s a line, you can skip ahead if you have a baby!… and you better, because baby has to be there). Print out the appointment sheet when you schedule online and take it with you. Submit all these documents at the counter, sign when prompted, pay and swear the oath that you’re telling the truth and then wait at home for your documents to arrive! So, it’s a bit confusing, but all our Japanese documents list our daughters name as Last Middle (,) First. We ran to the Embassy to hopefully get her passport issued before needing to go to Immigration but it didn’t arrive. So we crossed our fingers and headed to the IO. The Immigration representative told us that because there’s no essential name difference (just a difference in the order of the name), that they would issue it as is- according to the City Hall paperwork- and when it comes time to renew her residence card, it will be changed to read like the passport (like everyone else in our family). So, no problem, but essentially we’re delaying dealing with the difference until later. At this point, I don’t care! The fact that after a c-section we accomplished all the above- two of the offices being an hour away- within 30 days means that I get a golden star. Or at least a participation ribbon showing that I am now the mother of a bonafide citizen of the US and resident of Japan. But realistically, it just means I have a lot more paperwork to file away. Last Sunday, we attended our first Japanese wedding. For my part, I was excited and a little nervous– and not just about keeping a toddler and a newborn happy during the ceremony, but about celebrating appropriately Japanese style. So, I thought I’d share about our experience. Our friends do speak some great English, and so there was a bit of an international feel to it… as compared to a super traditional wedding at a Shinto shrine…. The venue was a beautiful little cove in the heart of one of the ritzy areas of downtown Tokyo. This place specializes in weddings, and it seems that many such places have full-service packages– from the invitations to menus to flowers to the bride’s dress(es). Yes, in Japan, most brides rent their dresses. When I was engaged and living in Japan, I wanted to do some dress shopping but no one could point me in the direction of a place that actually sold dresses. One highlight for us was that our oldest daughter had the chance to walk down the aisle with the groom. It seems that in western style weddings in Japan, there is no tradition for the groom to walk down the aisle with his mother. He said that his mom was too shy to do such a thing as well. So our daughter had the honor, and for an almost 3 year old, I think she handled herself well! A notable aspect was that they announced everything. For example, each person coming down the aisle was announced beforehand (similar to an American reception??) and during the reception, there was a MC, who announced all the participating parties and some of their details. The bride and groom’s background info was also shared. Even the menu and wine menu were announced. Reflecting on these various announcements, while teaching at the elementary school (rabbit trail: many of the groom’s students– he’s an English teacher at a middle school– showed up in their uniforms to watch the ceremony), often before I began my lesson, the teacher would signal a student to stand up and announce the previous period of study had ended and from now, we would begin to study English. Everyone would respond with “We begin!”. Lunch menus are also read before serving lunch and everyone confirms what they have on their plates. To me, it seems to show an inclination for organization in events, where clear beginnings and endings are defined and proper recognition is given. During the reception, a number of speeches were given. The groom gave a welcome at the beginning, the employers of both B&G spoke, a few friends spoke, there was a quick interview from one guy about the groom, the bride gave a speech to her parents and the father of the groom gave a speech… and perhaps others. Near the end, giant bouquets were given to the parents and there was a lot of formal bowing from the B&G and their parents to thank us for joining them. The B&G’s friends also prepared a very short piece of entertainment for the company. The groom’s friends- a short skit; the bride’s- a cutesy dance. On to gifts. If you are invited to a wedding in Japan, the gift to give is money (crisp bills) in an envelope inside a special envelope. As a foreigner, be careful to confirm it’s a wedding envelope at the store and not a funeral envelope– they can look similar. How much do you give? Hold your breath, it can vary but the customary amount for a friend is about $300 USD (Three $100 bills). Yup. Employers typically give $500-$1000 and for family members, it depends on the area whether you give or not, it seems. Two and four should be avoided because they are unlucky (4 and 2 put together in Japanese sounds like the word for death). Even numbers should also be avoided because they can be associated with being split or divided. In Japan, it’s custom to give a gift back. In America, we give party favors. However, on the guests’ seats (one per couple), was a bag with two beautiful gifts inside. One had an assortment of pretty desserts (not quite cakes, but more like breads? and some cookies) and the other contained a catalog. A catalog from which you could choose a gift that would be delivered to you. These were gifts similar to what you would give the B&G as a wedding gift in America and ranged from kitchen pots or pans to towels to make up bags or special jams or teas. Say whaaaaaaaaaaaaaaaatttt? Yeah, that was my expression when I opened it. I’m not sure if that’s how it generally is here (I know that the gifts are usually very nice), but I was floored. Each kid also had a sweet coloring book and a nice pack of crayons and snacks at their seat. As we left, we received tiny little boxes with cute little heart cookies inside. And Rosalyn received a beautiful little bouquet. Speaking of leaving, the MC closed the reception at exactly 2pm. Like on the dot. Amazing, huh? Very different than an American wedding. Literally, every detail was thought of. Everything was sweet and beautiful and carefully prepared. It was a highlight for us, and celebrating their marriage over course supersedes all these details. We are excited to see what God has in store for them together! I’m sure that there are many variations on weddings here, but the fundamentals will likely be the same. Fascinating! So, if you ever have the chance to go to a Japanese wedding, you have some idea of what you might encounter! Well, well, well. Turns out two kids is more than one. I’ve been home now for about two and a half weeks. It’s been… busy. I’m not sure how any moms get anything done?? One of the challenges since we’ve been home is in the actual name of our new daughter. I know right. My husband and the pastor of the church took our paperwork, including the birth paper issued by the hospital, to the city hall to get her birth registered and get health insurance, etc. More on all that later. However, the gentleman at the birth register desk insisted that the Japanese way to write her name was not the way that we wrote it. Let me explain, using initials, for discretion. Her initials will be E V A, according to how we’d write it in the States. In Japan, using the format of our passports, her name would be written A E V or, more rarely A, E V. That’s the way my name, my husband’s name and our other daughter’s name is written for all of our paperwork. Speaking of names though, something that stumped me when I was at the hospital was how many of the sore and exhausted moms I’d talked to had still not chosen a name for their baby. I was flabbergasted. With our first daughter, we had her name chosen even before we were planning to have kids. I made some inquiries over breakfast of the moms and learned much in the process! You think choosing a name in English is difficult? We’ve got nothing on the Japanese. Japanese obviously use kanji (Chinese characters) for their names. Every kanji has one or more meanings and sometimes numerous pronunciations. And every kanji has a stroke order and a stroke count (that’s how you look it up in the dictionary). For the Japanese, the number of strokes in the kanji chosen for their name can either be lucky or unlucky. Certain numbers are lucky and others are not. In fact, there are about five different categories (for example, love, job, money, etc.) that have to be determined, and while a name you’re considering may be lucky in 4 of the categories, parents want it to be good in all five. It gets more complicated. The kanji of the last name have to be taken into consideration as well, as it’s the total number of strokes in a name that matters. Apparently, the combination of kanji (first and last, first kanji of both names, second kanji of both names, etc.) matters too. Then you want to be careful that the kanji of both names make sense together. You wouldn’t want to have a mix-up of number kanji, or seasonal kanji or recurring syllables when you write/say it all together. And, of course, too many over-all strokes will be time consuming for your child. Parents these days use online dictionaries to investigate potential kanji for their child. Once they find a number that will work for them, they can get lists of kanji and start piecing together their child’s name. Of course, then both parents (and often grandparents) have to approve of their name and it has to feel right for the child too. It had always been a mystery to me why none of the Japanese pregnant moms I’d met had revealed the name for their child before birth. I wondered if it was a bad omen to say the name before the birth or if it was a secret or just not their custom. We announced our daughter’s name when we confirmed the gender, but none of the Japanese thought to ask the question (whereas for our American counterparts, it was one of the first questions!). But now I know…. it’s complicated! Well, it has been a busy busy day for me! Since feeding time will be coming soon and I want to catch some Zs before then, let me get to it. -I was feeling well enough to eat breakfast with the other moms in the lounge this morning. Thankfully they were more talkative than last time. I got a lot of insights about their process of choosing a name (goods for a later post) and they asked a lot of questions about America and hospitals there. Anyhow, as we were all leaving to collect our babies, one mom came to me to let me know she speaks a little Spanish. She is part of a group interested in learning foreign languages with their kids and asked me if I would come and participate sometime and if maybe we could even share about our countries (V and I) with the group. So, awesome new momma friend and probably it will be a few months before that comes to pass but what a great opportunity ! -Today I had meetings galore with staff members. A long discussion with one staff member about vaccinations* and the process, where different ones are done, next appointments for the baby and how to schedule them. I have lots of paperwork about that all and she even did research to find me the some of the same files in English! How kind! A meeting with the midwife to discuss how to take care of myself and the baby, when to be concerned about things, when to call the doctor, things to watch out for. A meeting with the… pharmacist? To discuss medication, if I requested any prescriptions, what to tell any other doctors I visit, etc etc. So I’m a bit Japanesed out today. -I got a rubella vaccination- something mentioned many times over the course of prenatal care since it seems I didn’t have the antibodies for it or that they were low or something. So the conclusion was finally understood that today we’d be taking care of that. -I learned how to bathe my baby. Well- the nurse knew that I have a kid and so she didn’t really show as go through the motions with me. They do it with all moms, so it had to be checked off the list. It’s been a while, so it was a nice refresher course on how to wash a slippery little human being. -Guests popped in and out for visits. -I got paperwork and surveys filled out in Japanese. The staff helped answer the paperwork that will be turned into the government– some questions I wasn’t sure how to answer. And I think that’s my day. Besides time with family and of course my newest daughter and later tonight packing everything up for our “tai-een” (check out) tomorrow. Overall, it’s been a great stay, despite the problems. I’ve learned a lot and received a lot of care and help. While I will miss having nurses that I can call at all hours of the day to request a specific amount of formula, warm and ready to go, I’m ready to go too. So, yes! 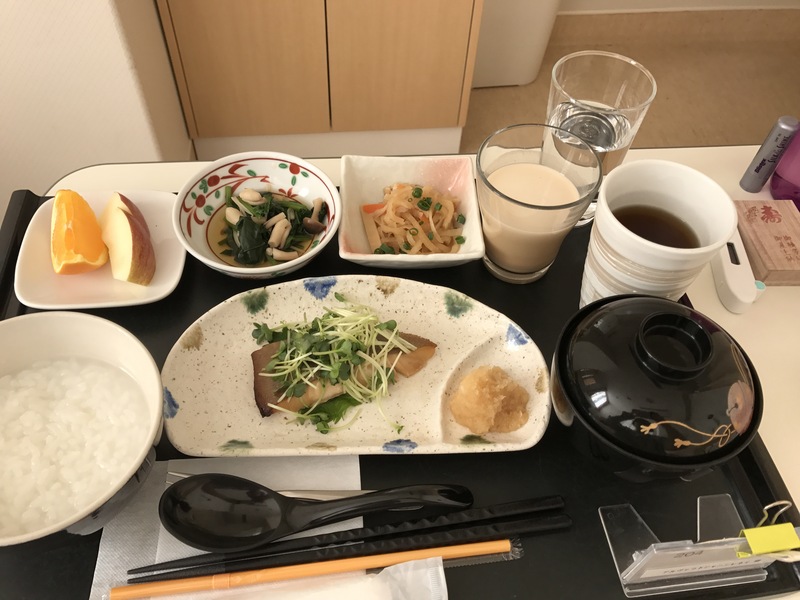 Thus has been my Japanese hospital experience, I give the clinic here an A+ in every area from medical care to baby training to facilities to hospitality to bedside manner to everything. To any foreign woman in the general vicinity who may have found this post, I give this place two thumbs up- please use this clinic! And to the rest of you, I’ll catch you on the other side of the hospital doors! Yesterday, I didn’t even proofread the post before hitting publish (which I never do!). I was functioning but at an apparently low level. So I apologize if there was anything incoherent in there. Anyhow, today’s post won’t be long but I did want to say thank you to everyone who has been praying for us– the headache source was indeed epidural related and by the morning, I was unable to even sit for more than 30 seconds before the headache became absolutely unbearable. The doctor came, explained what a blood patch was to me and the success rate, had me sign papers in Japanese and viola, I was scheduled for one at 1pm, which could not come soon enough. The nurses, as always, were extremely kind to me. They really helped me during the process and the doctor talked to me during the procedure about the difference between American accents and that he has had trouble with British and especially Australian accents in the past. Apparently 1-2 Americans (or English-speaking women?) give birth here every year. Anyway, PRAISE THE LORD, it worked (the back up plan was vague and scary), and I almost hugged him as he helped me down from the OR table (a place I didn’t really want to see again but now have been able to exit from with a sense of closure- no puns intended). Every staff member throughout the rest of the day stopped to chat with me and ask me about my condition and to be elated that I was better. I’m guessing they heard about my hot mess postpartum breakdown last night in front of a nurse and my family with my two year old getting in my face to ask, “mommy, what’s torn? What’s torn?”, which we understand to mean “what’s wrong?”. So I’m alive again, and so, so happy to enjoy the simple pleasures of life again. Like moving my neck. -Also included in my room “gift bag”- I can’t believe I forgot- was a tiny little wooden box with gold kanji to keep the umbilical cord. Said box is now occupied but what I’m going to do with it, I have yet to figure out. I’ve found myself asking “how did they know I was going to need…” “how did they know to come with such and such at this moment?” “Oh yeah, I’m gonna need one of those” multiple times during my stay. 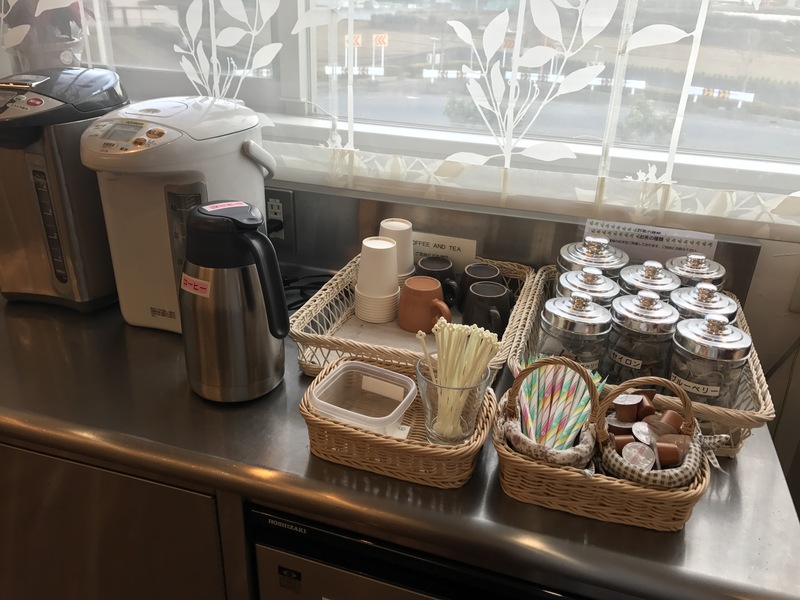 The Japanese are great at looking ahead and thinking through what you will need and providing it before you need to even ask (or in some cases, think about it). While it’s awesome to be on the receiving end, in every day relationships, it can be hard to reciprocate to such a degree because they are so good and reciprocation is always expected (though they’ll say “no, no”). For example, my prego neighbor took me to an appointment in her car a couple of weeks ago and we were going to do baby shopping afterward. I had Rosalyn with me and she had packed a bag of snacks and juice for Rosalyn to enjoy while waiting. I have more stories, but how do you get to be so thoughtful? -I get to control the temperature of my room. That is control, people. I think it’s a requirement that all American hospitals be like ice boxes (I understand cooler temperatures mean germs increase more slowly). But not mine! We are nice and toasty up in here. -I have a paper from the hospital certifying that baby was born here. This paper I will take to city hall to eventually receive the birth certificate. That’s a process I’ll describe later. But it’s so interesting that I have to go file for myself, it’s not something the hospital does for you here. Everyone has to go through this process. -I was handed my paper today telling about how much it would be to discharge from the hospital (to be paid in full on exit). We already paid a down payment to register and leaving will be more than I expected (I think due to the blood patch, but worth every yenny), but it’s really nice not to have a foreboding sense of doom at multiple, vague invoices to be later received asking for payment- a doom augmented by another language. I remember cringing I opened the mailbox. When I’m done here, I’m done. And we’ll, for the time being, I’m done here too. I’m going to catch some Zs before the next feeding. I’ll keep you posted if anything else interesting happens around here! 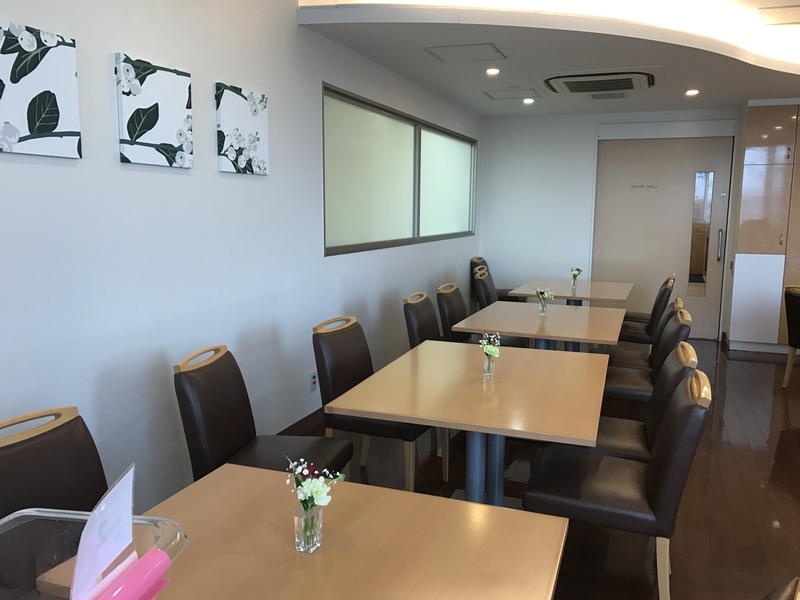 I thought I’d post a few pictures of the food and lounge, where I happen to be right now, enjoying a cup of coffee which I was able to locate yesterday. Recovery continues and the hospital has been extremely helpful. My only serious malady is the continued headaches. There was a bit of discussion as to whether they are related strictly to the out-of-whack neck or if it’s related to the epidural and it’s after effects. Nonetheless, when the nurses heard, they gave me bean heat packs to help with the sore muscles. And after asking 3 times or so for meds, the doctor finally gave me my own stash in my room. In other news, the thing that blew my mind yesterday was that they served créeme brûlée for the afternoon snack. Seriously? What places serves it in the first place? 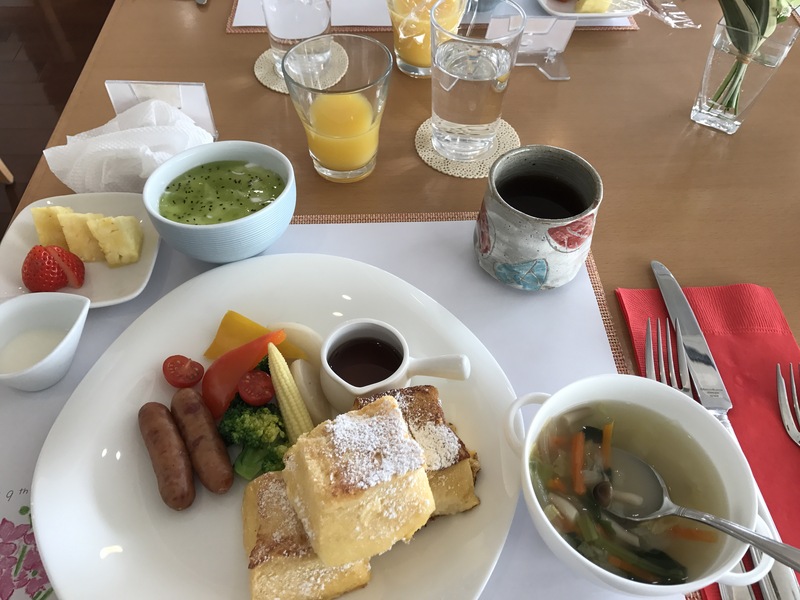 I was able to have breakfast in the cafe this morning (lounge). It’s where breakfast is normally served but until today it’s been delivered to my room. Today there was a special treat apparently because one of the staff members who is an artist did pictures of the flowers associated with the birth days of our babies and what their meanings where. It was copied onto a paper placemat and we received the original on a 4×6 size postcard. You can kinda see what it looked like on the bottom left corner of the French toast picture above. Yep, that’s what I had for breakfast. Anyway, everyone here is very thoughtful and helpful. All details are thought out and what you could possibly need is so often provided before you could even think to ask for it. Again, the only thing I don’t quite get is the low, flat beds and how that works for a c-section momma but I suppose I’ve survived. Well they are getting to the afternoon snack time so I better beat them to my room. Wonder what it will be today?! ?